Members of the Nigerian troops in north eastern part of the country under the operation tag, ‘Operation Lafiya Dole’ have written an emotional letter to President Muhammadu Buhari and the Chief of Army Staff, Lieutenant General Tukur Yusufu Buratai in response to his recent letter to the team. The troops in the letter on Monday evening asserted that the COAS’ recent letter to them in the battle field was a boost to their muscles. The letter jointly signed by Pte Samson Okwudili, Sgt. 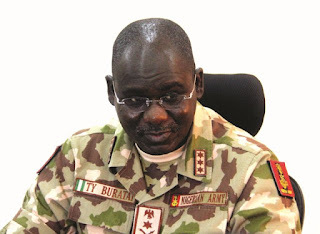 Aliyu Bala, WO2 Bode O. Ola assured president Buhari and the army chief that the troops won’t relent until the battle over insurgency is totally won. “We further wish to specially acknowledge you, our Chief Commander and COAS, for your sterling leadership qualities and purposeful leadership of the Nigerian Army. We have all come to know you as not just as astute leader of Nigerian troops, but a reformist, performer, comforter, a humanist, a welfarist, an exceptional officer.